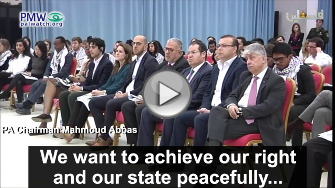 "We will not choose a path other than negotiations... We believe in peace and believe in security for everyone." 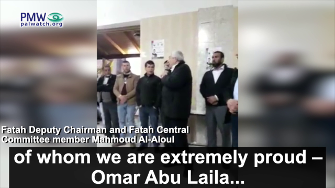 "We are extremely proud, this is Omar Abu Laila... [he] represents all young Palestinians." "We are extremely proud, this is Omar Abu Laila, who implemented his choice, who implemented the people's choice... through which he represents all of you, represents all young Palestinians." "We will not choose a path other than negotiations... We believe in peace and believe in security for everyone... We made agreements with 83 states in the world... on one issue: the war on terror in the world, terror in all its forms, variations, and sources." 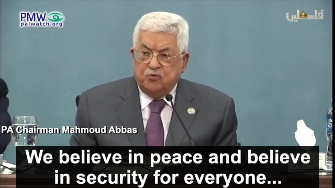 According to Mahmoud Abbas, the PA believes in "peace" and "security for everyone," and has joined the "war on terror in the world, terror in all its forms." 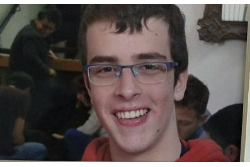 But according to his deputy, Mahmoud Al-Aloul, a terrorist murderer who just a week earlier killed 2 Israelis makes the PA "proud" and is a role model for "all young Palestinians." This is yet another striking example of Palestinian Authority hypocrisy and duplicity, which Palestinian Media Watch has documented for years, and particularly in the book Deception. This duplicity is a well-rehearsed PA "modus operandi." For example, in 2014, PMW exposed that when Abbas spoke with Israeli students he talked about the shared desire for "peace," but previously - when Abbas spoke to Palestinians - he had praised the murderer of 2 Israeli students as a "heroic brother." It should be noted that the PA not only glorifies all murderers of Israelis, presenting them as role models, but they continue to pay salaries to terrorists in prison even when they can't pay the salaries of their civil servants. The PA continues to be a terror supporting entity and until international leaders realize that and respond to it, there can never be meaningful steps for peace. 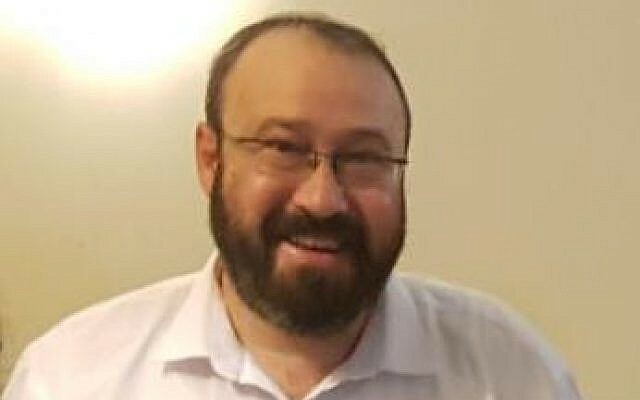 Only when world leaders recognize that the PA and Fatah can only be trusted in what they say to their own people, and insist that the PA reject terror and fight terror in a meaningful way among Palestinians, and not merely pretend to do so to Harvard students, can a serious dialogue towards peace begin. "It may have pained us deeply when we parted from this Martyr, when we parted from this self-sacrificing fighter, of whom we are extremely proud - Omar Abu Laila... This young man, this youth, of whom we are extremely proud, this is Omar Abu Laila, who implemented his choice, who implemented the people's choice, who implemented the available choice, through which he represents all of you, represents all young Palestinians." "We want to achieve our right and our state peacefully... We will not choose a path other than negotiations to achieve our right. We always say that we are extending our hands to the Israelis... We believe in peace and believe in security for everyone... We made agreements with 83 states in the world... prime among them the US, Canada, Britain, European states, Japan, and the like - on one issue: the war on terror in the world, terror in all its forms, variations, and sources." The Al-Ayyam Palestinian daily newspaper added quotes from Abbas' speech that were not televised. 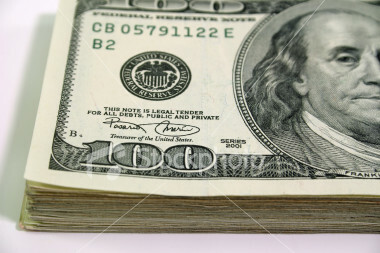 "I rule out the possibility of violence, and we will not use it. We will not accept violence at all, but there are [other] things we can do to achieve our rights, and to protest the denial of our rights... We want to achieve our rights and our state peacefully, in other words through negotiation, and we will not choose a path other than negotiations to achieve our right. 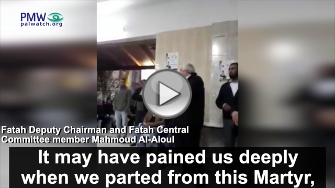 We always say that we will extend our hand to the Israeli government that will be elected."